The Class of 1957's next major reunion - 65 years - will be in 2022. Contacts: JoAnn Pechar at jtpechar@cox.net or Shirley Shiery at sshiery@cox.net. 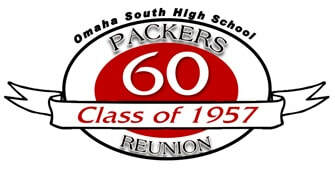 Details: A 60 year reunion will be held at the Comfort Inn, 70th and Grover, Omaha at 5 p.m.-??. Food and drink will be available to purchase. No mailing will be sent. Watch for more details in the Alumni TOOTER. Friday Night: Come get reacquainted! Join us at Horsemen’s Park from 6:30pm to 9:30pm. Food & drink on your own. Saturday Night: Join us for dinner Saturday night at the Millard Social Hall (10508 S. 144th Street, Omaha, NE 68138) from 4:00pm to 10:00pm. Buffet dinner served at 5:30pm; cash bar.